Asked & Answered: What News Anchor Did You Trust the Most? Appearing on Fridays, This Was Television Asked & Answered is a chance for the writers of TWTV to answer questions about TV history. Questions can range from the personal to the critical about historical television. Asked & Answered has been on hiatus for a while, but we thought we’d bring it back for the warm summer Fridays. This week’s question is: What news anchor (or reporter) did you trust the most growing up? Noel: Like with any number of media habits, the broadcast news anchor that was determined by my mother, and as a result the one I would say I trusted the most was Peter Jennings, the host of ABC’s World News Tonight from 1983 to 2005. Jennings started the same day as Tom Brokaw did at NBC’s Nightly News and two years after Dan Rather took over for Walter Cronkite at Evening News on CBS, marking a shift in the broadcast news guard as it were. While I think some of my mom’s choice was motivated by the fact that World News Tonight preceded the start of Entertainment Tonight on our ABC affiliate, in times of big crises, my mother also flipped to ABC first to check and see if Jennings was covering the event before she switched to Brokaw or to CNN (she never liked Rather). Looking back, I can’t tell you why I trusted Jennings over Brokaw, Rather, and the growing cabal of CNN anchors and reporters in the mid- to late-90s when I was paying more attention to television than I had before. Part of it is, as I alluded to above, that aspect of media socialization, to the point you look at your Instagram follower count intensively — Jennings was on more than the other guys, so obviously he got it “right” or whatever it was we were “looking for” in a news anchor — but the other aspects are probably more ephemeral, and decidedly superficial. I liked his ever-fading helmet hair and his dry-but-not-trying-too-hard wit (Brian Williams, as much as I love him, overplays his tone on lighter fare). In fact, it may have been Jennings voice, more than anything that I just found to hit the right measure of accessible authority without sounding too old or too gruff. Andrew: My answer, in part, is much like Noel’s. My mom watched Peter Jennings, and so that was my anchor. Actually, that is only somewhat true. My mom watched the local ABC 6pm Eyewitness News, led over time by anchors such as the poultry-loving Ernie Anastos, long-standing anchor Bill Beutel, and the melodically named Sade Baderinwa, and when my dad did not get home by 6:30 we stuck with Jennings. So much like with Noel, he became the voice of my news by default. But I became a news junkie myself, enough to go to school in DC with a degree in political communication, and so I developed my own personal preference in newscaster. It is my belief that the voice you choose as representative of your news is the one that you saw during the first big news event you followed, and so for those during the McCarthy era the voice is Murrow and those who remember JFK’s assassination may choose Cronkite, the big event I remember following was the 2000 election, and the voice and face of the man in the days that followed was CNN’s Wolf Blitzer. Regardless of your view on Blitzer, who I admit is overexposed, his presence was reassuring to a seventh grader who flipped on CNN right after getting home from school at 3pm for the latest updates on hanging and pregnant chads. The fact that Blitzer was there, everyday, when I needed him, made him the anchor I trusted. Emma: We were always very much a BBC family growing up and so all of my lasting news memories are of BBC newsreaders. The one who really sticks out is Moira Stuart and she delivered news in a calm and soothing manner even if it was the most horrendous event. At the time I didn’t realize how groundbreaking Stuart was as part of the BBC news team as she was the first African-Caribbean female newsreader on British television. The relationship between news anchor/reader and viewer feels very different in the UK versus the US; it seems like a much bigger role in US news and while there are certain news readers like Moira Stuart that I recall more than others I think when I was younger I implicitly trusted anyone who sat behind that desk. As a sidenote while looking up BBC newsreaders I did find this headline, which out of context (and probably in context) is the most bizarre thing. Now if you asked me that question I would say Channel 4’s Jon Snow (not to be confused with Game of Thrones’ Jon Snow) but my parents never even considered Channel 4 as a place to watch news when I was growing up so he only came into my sphere of reference much later. I find the whole US news anchor role and relationship with the audience to be fascinating and it feels to me like there is a bigger emphasis placed on this in the US versus the UK. Jessica: I grew up in a rabbit ears household that got ABC, CBS, and PBS and that was it outside of some blurs that occasionally formed into NBC. We watched the ABC nightly news and so for me the news has never sounded right without the late Peter Jennings to deliver it. The 90s were a strange time, a dangerous cosseted innocence for the United States punctured by outbursts of extreme violence. While many anchors seemed eager to shape events like the OKC bombing or Columbine into sensational events, it was a comfort to have a voice that would tell you plainly what happened and not treat it like this week’s exciting side-show. Heather: My parents switched between ABC and NBC during the 90s, and it was the voice of Tom Brokaw that I most associate with that time of news media. There was something about the gravely timbre of his voice; it was comforting, especially in times of chaos like the First Gulf War and, later, 9/11. He combined warmth, knowledge and a grounded perspective (the latter becoming all the rarer in our current media climate of sensationalism, political divisiveness and social sharing). That same combination is one of the reasons I like to receive my news now from Steve Inskeep at NPR. 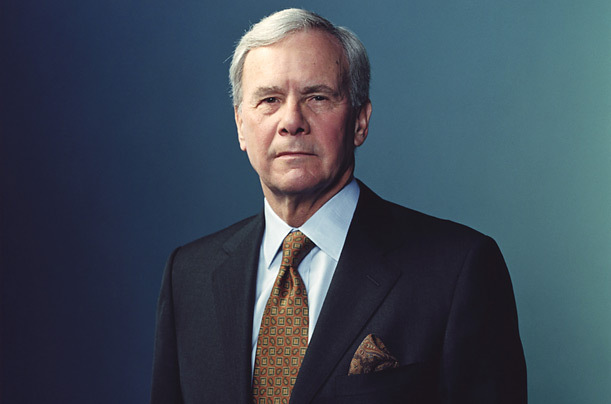 My memories of Brokaw, as others have mentioned, are the result of my parents choice of news. In junior high and high school, I started paying more attention to the news, and I began to gravitate towards Diane Sawyer. She is probably the anchor I trust(ed) the most. In her political interviews, she doesn’t take any bull—-. If the interviewee evades the question, she either presses harder or creates a comfortable environment in which the interviewee opens up in ways he/she wasn’t expecting. There were a couple of interviews I remember watching— she was like a terrier. A composed, incredibly intelligent terrier. As trite as it may sound now, I remember thinking of Sawyer as someone who sought for “the truth.” I appreciated that about her. Whitney: Like Heather, I was a Brokaw fan through and through. He was so comforting, and between his voice and habits he seemed like if someone wanted to create the perfected newscaster all you had to do was make a mold of Tom. He was all my parents watched for their world news so it is not surprise that I gravitated toward NBC Nightly News as I grew up. Tom Brokaw still offers a strange sense of comfort whenever I hear his voice reporting on something. Since his retirement (or rather his “shifting of gears), he has made a point of calling in to NBC Headquarters during times of disaster or breaking news events to give his take. When Osama Bin Laden was killed in 2011 many people pointed out that it just made sense that we needed to hear from Brokaw at some point. Large events just wouldn’t be the same without his voice on the other and of the line for five minutes of coverage. As I’ve grown older I almost exclusively look towards Scott Pelley now. During the Marathon Bombings, he was the only anchor making sure the audience knew what they needed to know without wildly speculating on what was happening and remaining calm the whole time. I must have watched him for 5 straight hours and his level of integrity and professionalism never faltered. He actually reminds me a lot like Tom Brokaw (as much as anyone can measure up to one of the best ever) in that he remains as impartial as possible while also seeming like he is always giving you the information that you personally need the most. It’s a talent we see less and less often in our newscasters, and it’s one that two of my favorites definitely share. Cory: I don’t have a whole lot to add, but it’s funny how much our parents shape us, even down to our anchor choices. The Barker household was all Dan Rather, all the time, which was great until the mid-aughts when it all came crashing down for the anchor of CBS Evening News. I don’t remember any particular nightly telecast, but I don’t think I’ll forget Rather and the CBS coverage coming on Viacom partner MTV during the aftermath of 9/11. I just want to add that, by watching Peter Jennings and World News Tonight, my television was all set for Jeopardy when it aired at its proper time, immediately following the news at 7pm, prior to Wheel of Fortune. national-Tom Brokaw, local (Chicago based)-Bill Kurtis (who went on to do some national as well as some terrific documentary work.